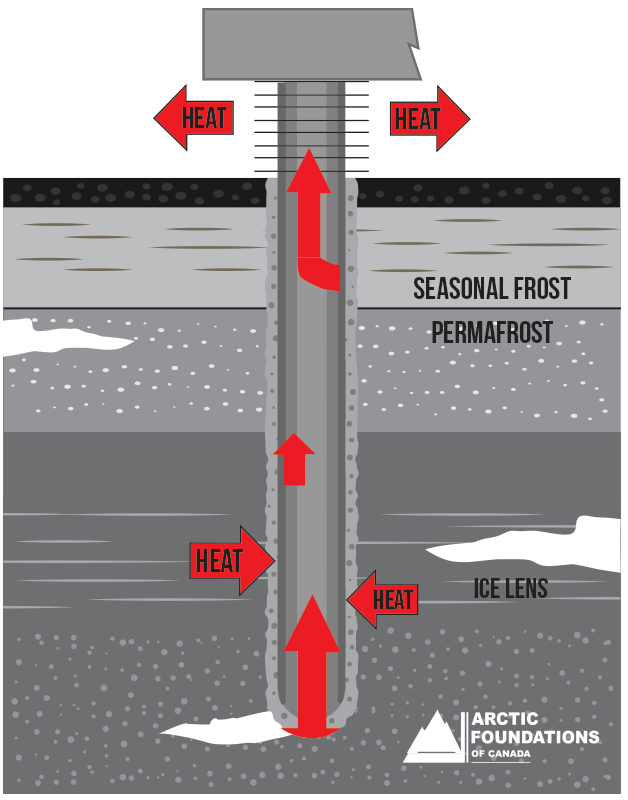 Thermopiles are thermosyphons that carry a structural load. The energy-free refrigeration ability maintains lower soil temperatures resulting in increased adfreeze, shear and compressive strength of the frozen soil. • create permafrost and thus stabilize thawed or thawing soils. The load is transferred from the pile to the permafrost soils by means of adfreeze bonding. The strength of this bond is temperature dependent and reduces to zero when the soil temperature is above 0°C. There is a very steep rise in the adfreeze strength as the soil temperature decreases below 0°C. Similarly the compressive and shear strengths of the soil also increases with a decrease in temperature.